After purchasing a scoopon/groupon voucher for this place last year..it is now one of my favourite local cafe/restaurant. It's a place where you want cheap tasty comfort food. The menu has changed a bit and now Stolley's menu consists of maily burgers. A bit sad because I enjoyed the other items in his previous menu such as the "gym junkie food options"
One of the main purpose coming on a Wednesday is for the lamb ribs for only $16.90 comes with mash and side salad! My sis in law ordered that, I did try a bit of it though, the meat was not the fall-off-the-bone type ribs but it was soft and tender. The sauce was BBQ flavoured - nothing special about the sauce (kinda tasted like BBQ sauce from the bottles) but it tasted ok but I don't think I'll order the dish for myself though (I am quite picky about how ribs should taste like!). 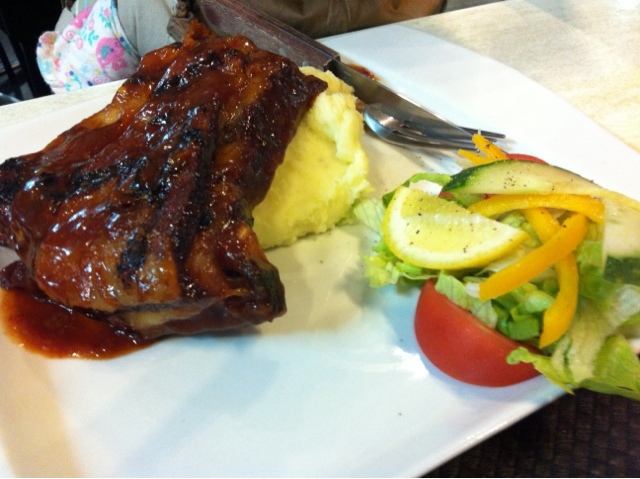 My sis-in-law enjoyed it a lot though and it satisfied her ribs craving! I would definitely recommend this dish especially for the price, flavour and serving! Totally worth your money IMO! The chicken - it was fried nicely, crispy on the outside and still tender in the inside. The skin was covered in seasoning & spices which gave it a bit of saltiness and flavour but I think it tastes better when you dip it in the Stolley mayonnaise. The german frites - tasted like your normal chips you can get at your local fish&chips store but covered in different spices. A nice twist to boring old chips! Stolley had a special promotion for the week after discovering the perfect beef bacon! So if you were to order a burger/sandwich you can request to add bacon for free! Unfortunately I forgot to take a picture of it because it was for take away as my midnight snack hehe. Unfortunately for my burger it was missing onions..but I didn't mind..would taste nice if there were some though. When I took a bite, you can taste the creamy and spiciness of the mayo, sweetness of the balsamic glaze and a juicy char grilled patty on a toasted turkish bread with fresh iceberg lettuce and tomato. The burgers are tasty - I particularly like it cos' you can see the chopped onions and spices in the patty. Service: do not expect fast service as most of the time it's a one man show doing everything - cooking AND serving you especially in the evening. When it's not busy, he'll come up and talk to you... check if everything is fine. Cons: Soft but not fall-off-the-bone (I don't eat much lamb though, so maybe it's just the type of meat?). Sauce kinda tastes like the bottled bbq ones. Overall: It's my one of my local favourite. Definitely give this place a try if you want tasty cheap eats. 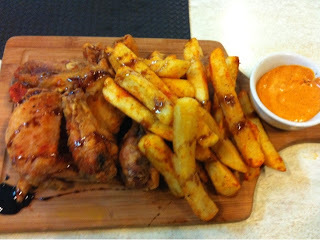 They serve halal food, and have chicken wing eating challenges! Recommended? Definitely! Cheap tasty food! why not?! So if you live around the block, give this place a try! Click here for Stolley's Facebook page : He updates his page regularly with specials of the day or if the shop is closed due to off-site catering!